(Source: The Telegraph)Meriam Ibrahim was raised in a Christian family and married Daniel Wani, a Sudanese biochemist who lives in the US, in a Khartoum chapel in 2011. 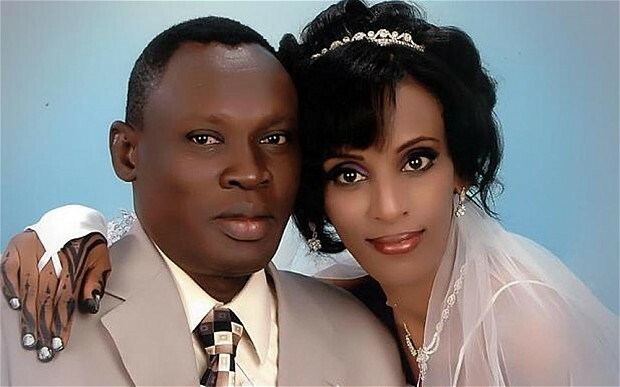 Meriam Ibrahim, 27, a Sudanese woman who was sentenced to 100 lashes and death by hanging for marrying a Christian man and converting from Islam to Christianity, will be freed, a Sudanese official said Saturday. BBC reports that they have spoken with a Sudanese official who confirmed that the woman's sentence will be lifted and the woman released in coming days. Abdullahi Alzareg, who is an under-secretary at the foreign ministry, told the news company that Sudan guaranteed religious freedom and was committed to protecting Ibrahim. "She will definitely not be executed. I am sure about this," Alzareg told the Sunday Times on Saturday. The Sudanese government in Khartoum has faced scathing criticism and international condemnation for giving Ibrahim the death sentence, as punishment for her conversion from Islam to Christianity. The global outrage grew to a veritable storm as people took to social media where the hashtag "#savemeriam" helped her story go viral. British Prime Minister, David Cameron, also spoke in support of Ibrahim describing the initial ruling as "barbaric," according to The Times news. Former British Prime Minister Tony Blair too described the case as a "brutal and sickening distortion of faith," according to ABC News. Ibrahim raised as an Orthodox Christian by her mother, was eight months pregnant when she received her sentence – since then giving birth to a baby girl while in prison. To avoid the death sentence, Ibrahim had to renounce her Chrisitan faith and "return to Islam." The ruling gave new life to a debate over the act of apostasy – abandoning the faith – where liberal and conservative scholars hold different opinions over whether, or how, abandoning Islam should be punished. Sudan is a country with a majority Muslim population where Islamic law has been the law of the land since the eighties. The southern part of the country seceded from Sudan in 2011 following a referendum, and became South Sudan, a country with majority traditional and Christian beliefs and where Islamic law is not enforced.